Current events have caused an increase in employment screening. Federal and state laws require that background checks be conducted for certain jobs. For example, most states require criminal background checks for anyone who works with children, the elderly, or disabled. The federal National Child Protection Act authorizes state officials to access the FBI’s National Crime Information Center (NCIC) database for some positions. 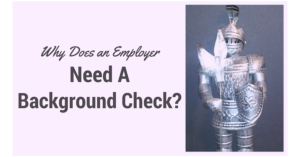 Many state and federal government jobs require a background check, and depending on the kind of job, may require an extensive investigation for a security clearance.